It’s the first of June, but it’s seems like it’s winter or early spring. In fact, it was raining for a bit this morning, but luckily it stopped by the afternoon. I did major pruning on our four pear trees. 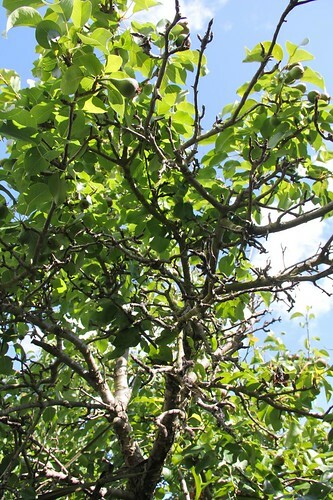 I noticed that there were a lot of dead branches, so I pruned anything that was dead. I didn’t get everything, and I may leave one of the tall branches in the middle Bosc Pear since I noticed that that where our neighborhood hummingbird loves to perch and sing. I still have more to prune, but it was getting late and I was getting tired. 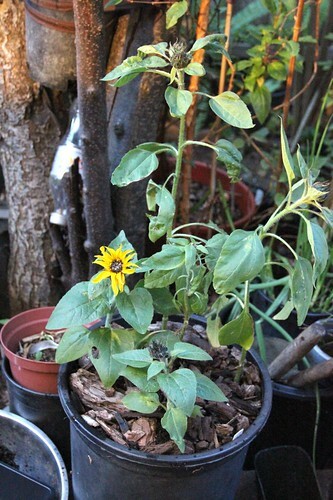 Before going in, I planted the 5 Dwarf Border Sunflower plants into a 5 gallon container. I’ll move this to the front later this week. 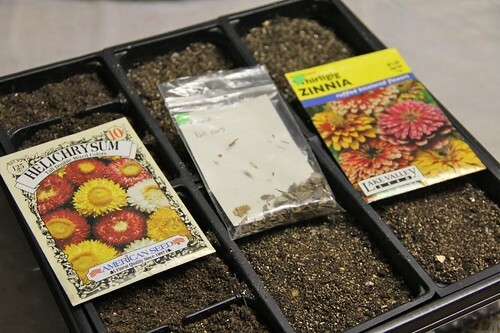 I also sowed Zinnia ‘Whirligig’ , Zinnia (Fall 2005) and Tall Double Strawflowers . 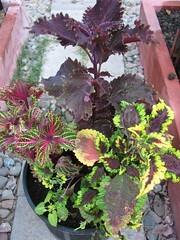 I potted up some Coleus pots this evening. 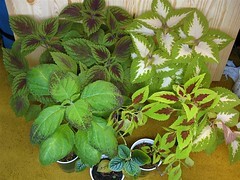 In one (first photo) I planted ‘Peter Wonder‘, ‘Splash‘, and an Unnamed Burgundy. 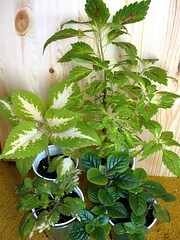 Between the three, I placed the Lamium ( photo ) that I rooted. 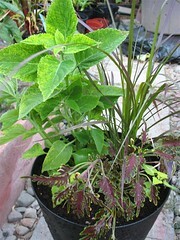 In the second (second photo) I planted ‘Dappled Apple‘, ‘Kiwi Apple‘, and half a 4″ pot of Red Fountain Grass. I also placed Lamium between the plants. 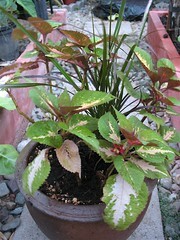 I used the other half of the Red Fountain Grass to fill out some of the empty spaces in an existing pot of ‘Amora‘ that was a little leggy and didn’t look so good. This seems to be the longest day… especially with yesterday’s incident. I couldn’t sleep, so ended up sleeping at about 5:30am!… I didn’t wake up and was late to work. 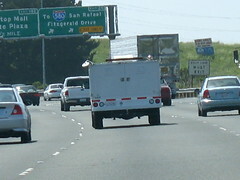 An animal control vehicle!!!!! I sure could have used them yesterday!!! Yesterday, one of my coworker was explaining some of my cameras features. I thought I would try my hand at a long exposure shot. This is taken at the parking lot near my work. I was working overtime and took a break outside. 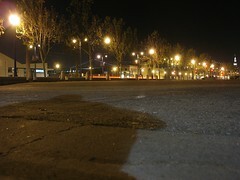 The street in the photo is The Embarcadero in San Francisco. Can you see my Honda Civic? Since I drove into work, I thought I would take advantage of my car and transport all my overwintered Coleus in one big batch (instead of my “What can I fit into one grocery bag” method. 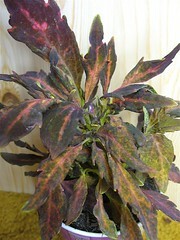 So after I finished all my work (at 11:30pm), I packed all the remaining Coleus at work and made my trip home. 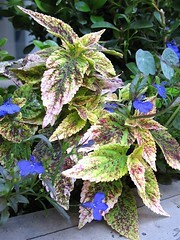 As I was walking to work this morning, I took an alternating route and saw this Coleus planted outside a large-well-known company’s window. Hmmm? Maybe when these grow bigger, I may revisit it… and accidentally bump into it. 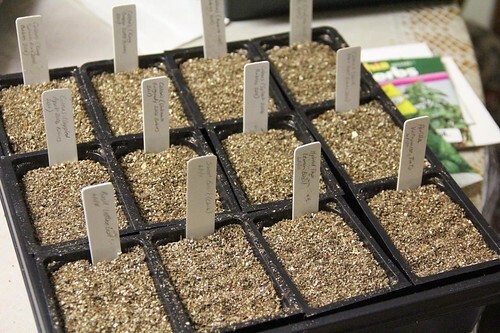 The weather is nice and has really warmed up, so I’m slowly taking the overwintering cuttings at work home… I’ll be bring them in batches… basically, whatever I can fit in a grocery bag. I had the one on the right last year, but it didn’t survive. 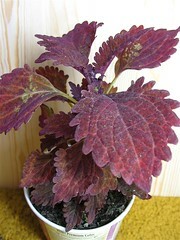 The label said ‘Cache’, but other Coleus were also labeled ‘Cache’, so I don’t think that this is it’s actual name. I also noticed that the Carex sp. (Ornamental Grass) that I planted on Jan. 31 has sprouted after a month a few days. I reorganized my two shelves with grow lights to accommodate the new potted seedlings. I also removed all the plants in the aquarium and just placed them on planting trays on the shelves. I also did two loads of laundry… This just proves that I definitely am a night owl… Now I think I’ll go back to bed and watch this weeks recording of Battlestar Galactica. The ‘Brandywine OTV’ and ‘Great White’ Tomato seedlings are about 3 inches tall and starting to show their third set of leaves. The two Pine seedlings are fascinating and showing their second set of leaves.